Not that long ago, the thought of another vintage sports watch – probably Rolex, because for quite a while that was the focus of my collection – would have kept me awake at night. It’s a funny thing, though, how tastes evolve and over the last couple of years I’ve found myself becoming increasingly disillusioned with and by what had become the staple additions. I sold quite a few (beauties, I might add), and found over the same period that I was also beginning to question my refusal to buy anything current. For a while now, in fact, I’ve had a nice balance of new and old, and a pretty even mix of sports watches and alternatives that are far more dressy. A couple of weeks ago I met a friend from TZ for a few beers, and I was really impressed by what he called his “left field” collection. I didn’t consciously spend time dwelling on this but I was aware that I could have been a little more… I don’t know, daring. It was while I was in that frame of mind that something popped up on SC that I simply fell in love with, and over the subsequent week or so I edged closer and closer to a deal without even the hint of a second thought about whether I was being sensible or not. I have to say that, after a couple of days of wear, I’m really delighted that I followed my instincts. 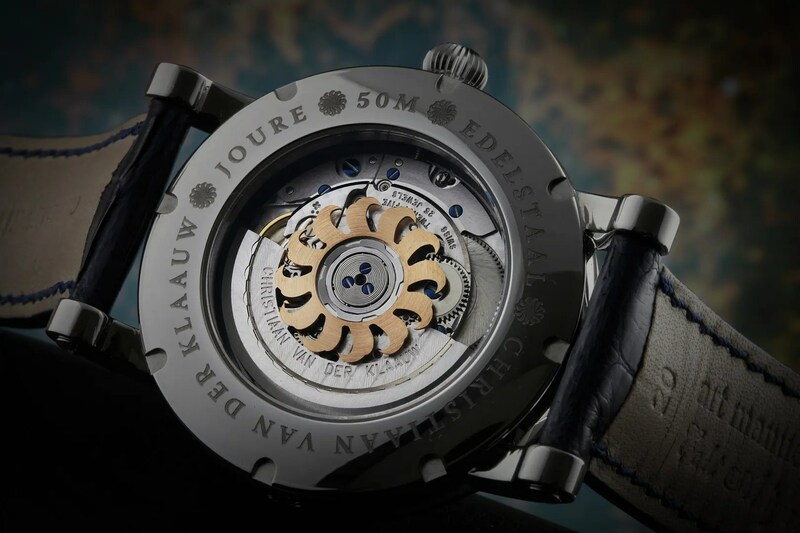 Christiaan ven der Klaauw is a Dutch watchmaker, and is also the only watchmaker in the Netherlands producing movement parts with his own hands. He was born, in 1944, in Leiden, the city where the Netherlands’ greatest scientist of all times, namesake and inspiration Christiaan Huygens started his studies in 1645. 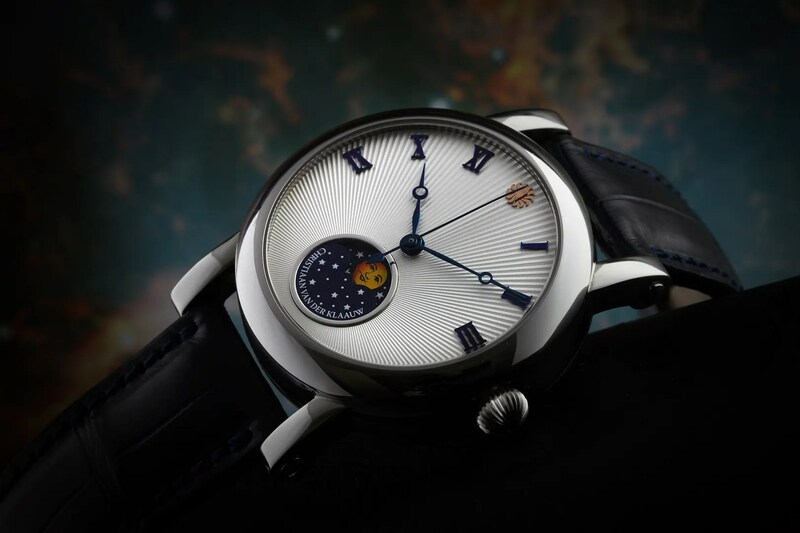 Van der Klaauw attended the School for Instrument Makers there, and some two decades after commencing his work as a watchmaker became known for his “astronomical watches” that he now shows regularly at Basleworld to much acclaim. 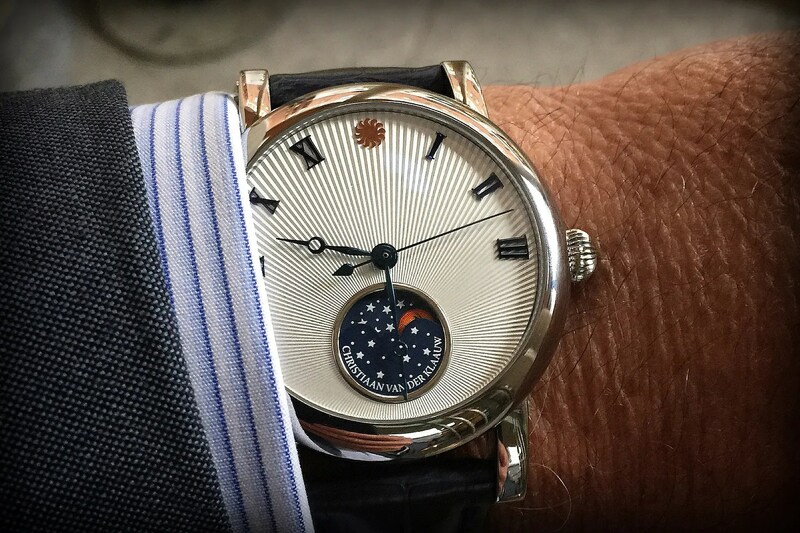 The watches are handmade, and the finished movements (based on ebauches that I can’t identify yet, although I’ve asked him the question by email) are heavily modified and then coupled with in-house modules that provide the incredible astronomical complications that set his watches apart. You can see the current CVDK collection here, in fact. 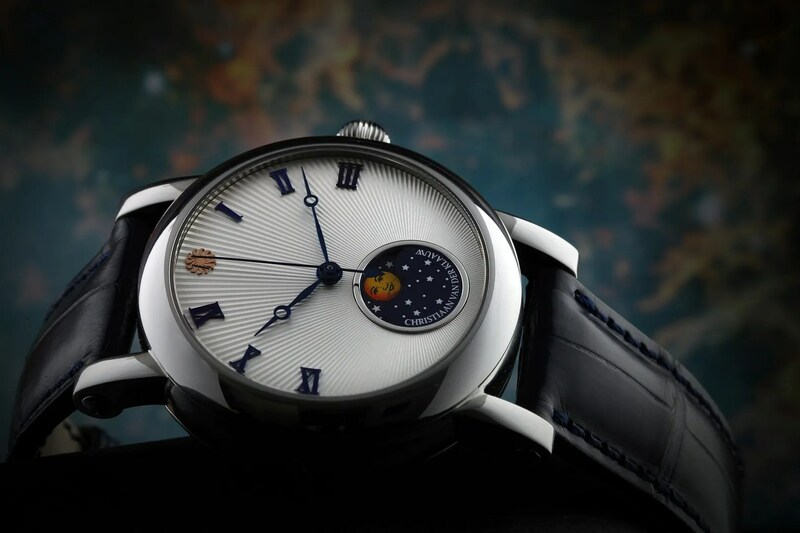 The watch that I found irresistible is the Ceres 1974. 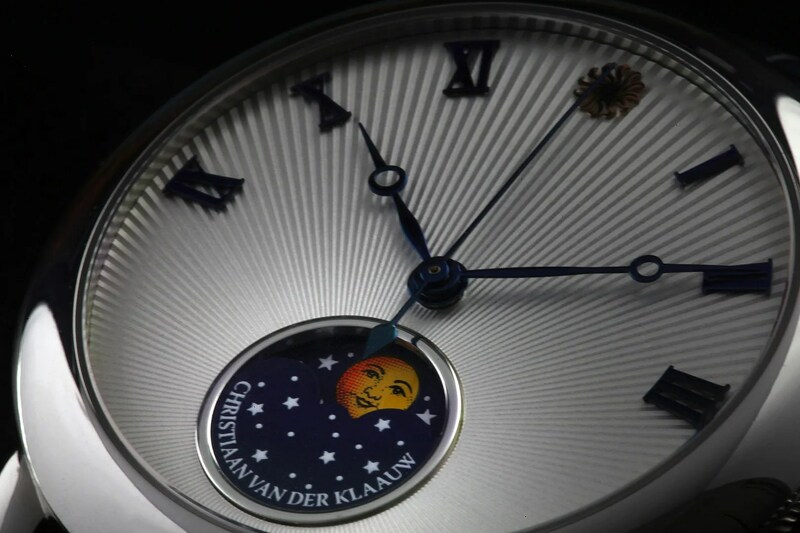 The dial is an amazingly textured starburst, on which an appliqué CVDK logo appears at 12 with the most gorgeous moonphase window at 6; applied roman numerals, in blued steel, are used for the 1-3 and 9-11 markers but the remainder of the dial is completely clean. The finishing touch is blued steel hands, in a Breguet style. The overall effect is, to my mind, quite beautiful, albeit that many will no doubt feel that the styling is a little too unconventional. Horses for courses, and all that. Movement: CVDK1068, automatic winding, 25 jewels, 42 hour power reserve complication (CVDK Ceres 1974 module). Functions: Hours, minutes, seconds, complication; moon phase. 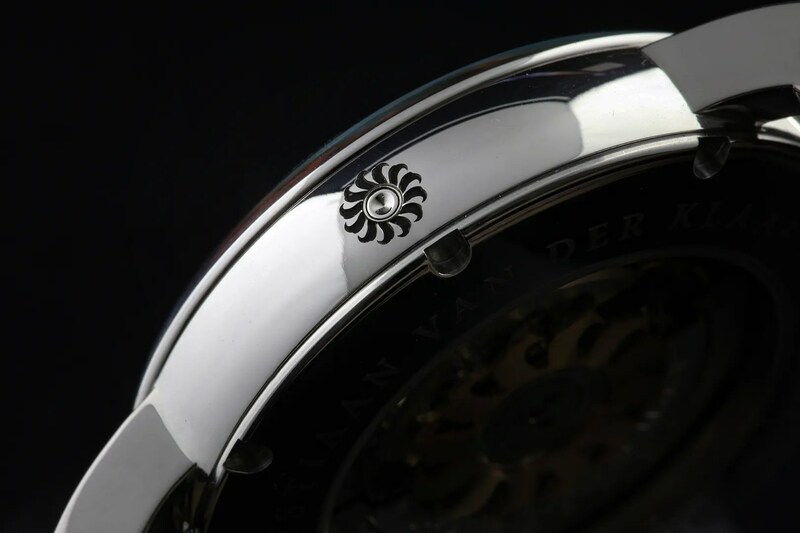 Case: Stainless steel, ø 40 mm, sapphire crystal, sapphire crystal case-back. Buckle: Logo engraved steel folding clasp. I’m not sure that anything other than handling this watch could ever do it justice, but my attempt in photos is below… no, it’s not the usual safe choice, but I love it all the more for just that reason. This entry was tagged Christiaan van der Klaauw. Bookmark the permalink. I recently bought a Ceres 1974. It’s a great evening watch. As I tell my friends before 9 is too early and after 3 AM is too late.. This is just really lovely. I didn’t know that he did a piece like this. Congratulations. Thank you. Some of the other complications are breathtaking.